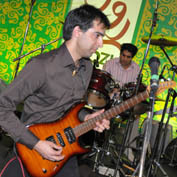 Riyaz is one of the founding members of RRAFIKI. Inspired by Bon Jovi, Riyaz started playing guitar in his later years of highschool. Riyaz is one of the Guitarists in RRAFIKI and he also provides with some of the vocals. Riyaz like Raheem has also taken to writing ballads.